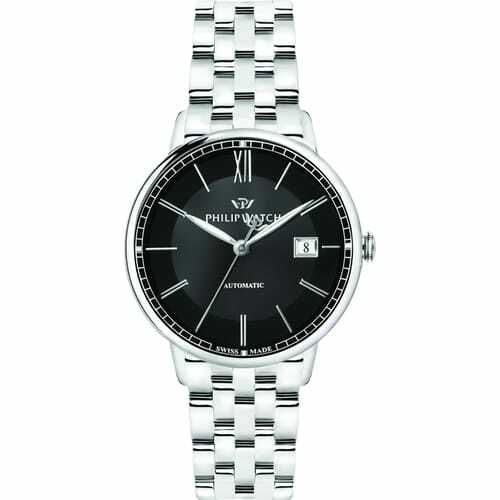 It scans your special moments with a unique style, this Philip Watch man’s watch from the Truman collection. With a sophisticated and retro style, it stands out just like every Philip Watch thanks to its classical inspired elegance. Several details make it versatile and contemporary, a perfect piece of jewellery for the men of today. With a steel bracelet, an important look, the simple and essential round case, with a diameter of 41mm. Silver ton-sur-ton details with the bracelet stand out on the quadrant with Cd pattern. Just like the indexes in cardinal Roman numbers and pointers. The case includes an ETA 2824 automatic movement, Swiss Made precision, a guarantee of excellence and experience in the art of watch making. This beautiful object is the result of the combination of two unique traditions: Italian creativity, producing watches with an exceptional design, and Swiss creativity, unique in its accurate and reliable mechanisms. The combination of these two elements produces models with a unique flavour, just like this man’s watch from the Truman collection, whose design is of a vintage inspiration but reinterpreted in a modern key. A resistant sapphire glass protects this style and precision, a time keeper with a sophisticated touch for men who want to express their style through unique details.